The zombie cats are helping me clean up the basement ... so much work already ... having gut spilling zombie cats only makes things harder. But we love em ... guts and all. Today is the last Friday that I actively promote commissions ... after this weekend it's all over for me. So get one before the getting is gone. The reason for this is simple ... while drawing and painting commissions for other people is awesome and fun, and I do know how lucky I am to have this gig, the stress of it all has been getting to me. It's not the stress of creating someone elses cat as a zombie ... that's easy. 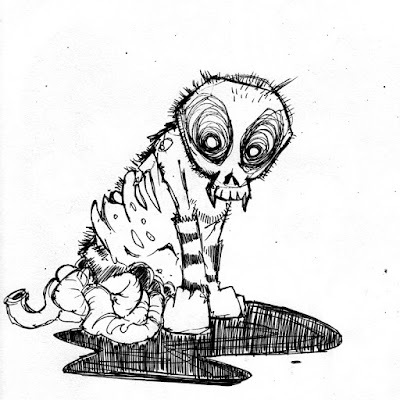 But the stress of relying on commissions and sales of individual work is becoming to hard ... so it's time to step away from that and just focus on creating more zombie cats, getting the booklets done AS I FEEL LIKE and start working a lot harder and smarter on the print on demand stores like zazzle, redbubble and society6.